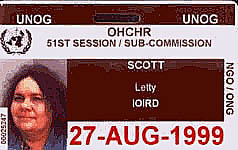 19 August 1999 LETTY SCOTT, of Indigenous Resource Development, said the Anmatyerre Nation in the Northern Territory of Australia demanded truth and justice and change for all peoples regardless of colour or creed. The speaker stated that her husband was unlawfully incarcerated in 1985, hit while in custody so that his eye was badly damaged; kept in solitary confinement; and never left prison alive. There was overwhelming police photographic and documentary evidence that proved Mr. Scott was murdered in custody. It was not possible to get justice at home. One eyewitness said Mr. Scott had been beaten by prison officers. The eyewitness was threatened and "deals were done" to ensure that individual officers were not at risk for any of their improper acts. A request had been made to re-open the case, but the Prime Minister had refused. The Northern Territory Government was currently seeking to strike out an application for justice. Other families had similar stories. There was widespread and systematic torture; murder was rampant. A Special Rapporteur should investigate and bring to account all perpetrators of these crimes against humanity.